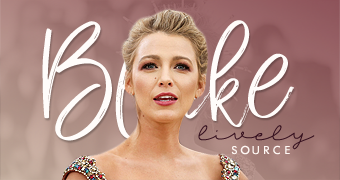 Blake plays a mother who remains 29 – never growing older, even as her own young daughter ages and becomes a grandmother herself. 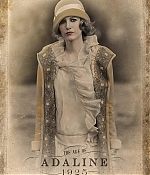 Check out these posters for forthcoming movie The Age of Adaline show her retaining her youthful complexion through the ages. 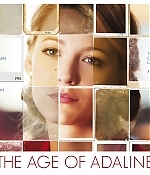 The Age of Adaline, which opens nationwide on April 24. “We had to make Adaline a real person, so there was a lot of playing dress-up in different eras,” makeup artist Monica Huppert says. “The ‘60s were the opposite of everything else—the ‘40s and ‘50s were about bright lips, like pinks and reds. The ‘60s were rebellious in their own way and different than anything done prior; it was all about paler lips and lots of eye liner.” Huppert used L’Oréal Pro-Last Lipcolor ($10) in Passionate Petal to give Adaline the perfect, subtle pink lip. As for Adaline’s bangs, hairstylist Anne Carroll tells us exactly how she created them: She clipped them in. 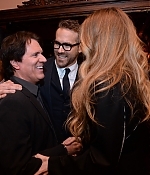 “The bangs were not Blake’s,” she reveals. 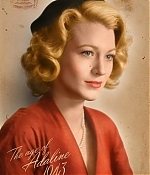 “They were actually clip-ons that I had colored to match her hair!” She collaborated with the costume department and costume designer Angus Strathie for the matching headscarf, after doing extensive research on all the different eras and citing lots of vintage photos for reference. 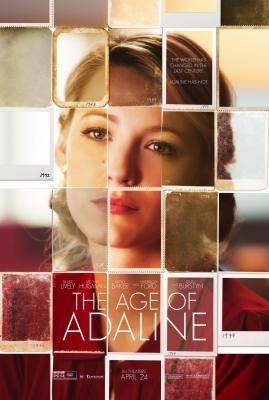 The studio has moved The Age of Adaline release date from January 23 to April 24, 2015. 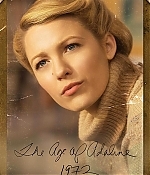 The Age of Adaline brings back to the screen Harrison Ford. 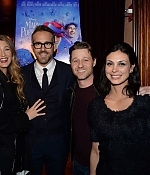 Blake Lively is joined by Michiel Huisman and Amanda Crew. Anthony Ingruber is set to play a young Harisson Ford William. Peter J Gray and Kathy Baker are also set to join the cast of the movie. 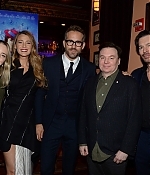 Sidney Kimmel, Garu Lucchesi, Alix Madigan and Tom Rosenberg are the directors while J Mills Goodloe and Salvador Paskowitz are writing the screen play. Filming ended in June 2014.